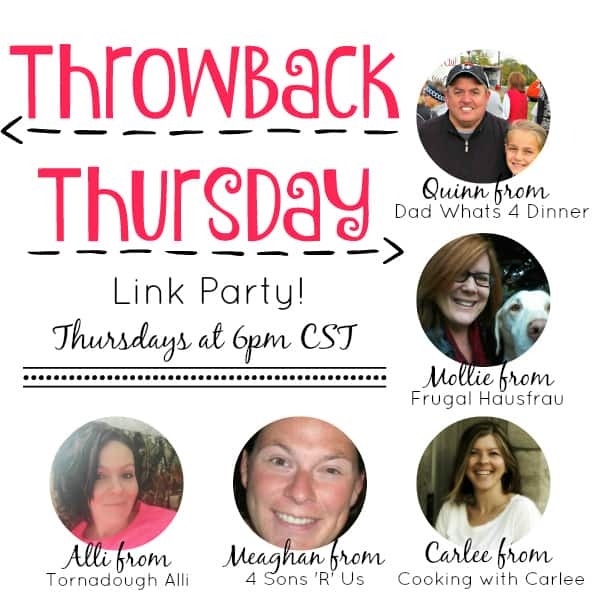 Welcome back to the 53rd week of Throwback Thursday! Come link up your latest and greatest posts or reach into those archives and show us some of your blasts from the past! Welcome back to the 52nd week of Throwback Thursday! Come link up your latest and greatest posts or reach into those archives and show us some of your blasts from the past! Welcome back to the 51st week of Throwback Thursday! Come link up your latest and greatest posts or reach into those archives and show us some of your blasts from the past! Welcome back to the 50th week of Throwback Thursday! Come link up your latest and greatest posts or reach into those archives and show us some of your blasts from the past! Welcome back to the 49th week of Throwback Thursday! Come link up your latest and greatest posts or reach into those archives and show us some of your blasts from the past! Welcome back to the 48th week of Throwback Thursday! Come link up your latest and greatest posts or reach into those archives and show us some of your blasts from the past! Welcome back to the 47th week of Throwback Thursday! Come link up your latest and greatest posts or reach into those archives and show us some of your blasts from the past! Welcome back to the 42nd week of Throwback Thursday! Come link up your latest and greatest posts or reach into those archives and show us some of your blasts from the past! Welcome back to the 45th week of Throwback Thursday! Link up your latest and greatest or dig into those archives and link up an oldie but goodie!